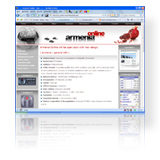 Taxation in Armenia - Withholding of Tax .:.::. The tax on monthly income less than 80.000 AMD as well as on royalties, leasing and interest income, paid to an individual is withheld by a tax agent on each payment at the rate of 10%. Taxes on monthly income in excess of 80,000 AMD is withheld at 20%. The tax rate on non-resident�s dividends and royalties is 10%. Tax on dividends is paid only by non-resident enterprises (i.e. non-resident physical persons are exempt). These rates may be reduced by a tax treaty. (e) rate of 5% applied for author's rights.